In a square in which the houses are evenly spaced around the outside, numbers $3$ and $10$ are opposite each other. What is the smallest number of houses in the square? 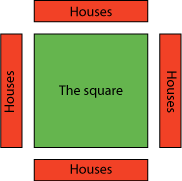 What is the largest possible number of houses in the square? Practical Activity. Addition & subtraction. Multiplication & division. Divisibility. Counting. Visualising. Combinations. Factors and multiples. Working systematically. Interactivities.